I’m a Caucasian Cumbrian and I have skin so I can safely use myself as an example. First thing, don’t be fooled into thinking that even my insipid skin is a light shade of pink because it isn’t, unless you count my ears after a couple of glasses of wine. Here’s a close up of my ears after wine. This is my cheek now. The colours are more browns than pinks, ranging from Burnt Sienna to a White/Burnt Umber mix. To get these colours I use Winsor and Newton Artists quality paints. The eight paints below are all I need; in fact I could probably get away with using five. 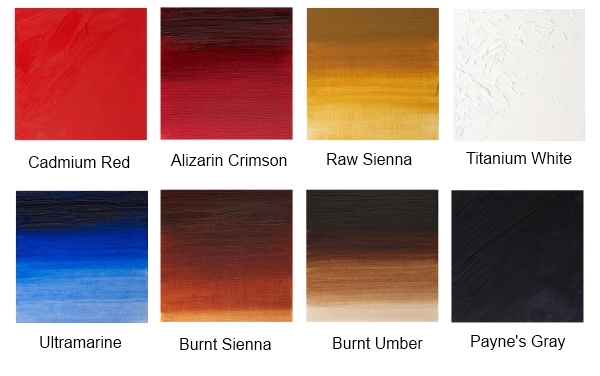 I mainly use Raw Sienna, Titanium White and a combination of Burnt Sienna, Burnt Umber and Cadmium Red, the tiniest bit of Cadmium Red imaginable. Once too much Cadmium Red gets in among your paints it’s like thrashing around in a blood bath, so try to avoid that, it’s nasty. For the lighter tones, Burnt Umber and Titanium White work well together. I never usually use Titanium White on its own unless there’s some extreme sunlight involved (see the desert sun on top of Walter White’s bonce). I hardly ever use Ultramarine on skin unless I’ve drank my ears pink again and I’m being really creative. Alizarin Crimson, I reserve for lips or dark bits around the eyes. When you’re starting a painting keep the strength of the colour down until you’ve got at least the basics of your background done or the colour of the person’s clothes. Once those are in place I usually find the skin on the face looks a little too pale and then I add more colour. I am a little bit cautious with colour, it sort of frightens me a little, and I envy people who splash it around. If you’re a splasher, once you’ve got the basic colours down and the background in, now is your time to shine.